After pushing top ranked side Australia all the way till the last game in the recently concluded three match preparatory series, the Indian Men's Hockey Team slumped to a disappointing 3 - 0 defeat against Argentina in the opening game of the Hockey World League Finals in Raipur. In front of a capacity crowd at the Sardar Vallabhai Patel Stadium, Argentina dominated the match as the hosts lacked co-ordination and looked disoriented. Argentina scored from three penalty corner situations with Gonzalo Peillat (3rd, 60th minute) finding the net twice while Joaquin Menini (24th) scored the other in the Pool B encounter. India recently jumped two rungs to be placed sixth in the world rankings but that didn't show in their performance at all against the Los Leones, who are placed just a spot above at fifth. Argentina's dominance could be gauged from the fact that they earned as many as nine penalty corners in the match to India's one. The hosts' problems were compounded by the display of their misfiring forward line, in particular an off-colour Ramandeep Singh. India looked out of sorts and rusty from the word go and the Argentines were quick to pounce on their opponent's weakness to earn their first penalty corner as early as in the third minute of the game after Jasjit Singh Kular committed a foul inside the circle. 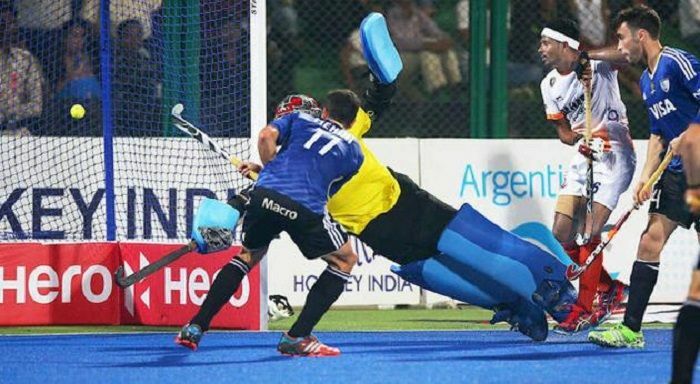 Argentina's drag-flick exponent Peillat made no mistake in giving his side the lead with a powerful flick to the right of the Indian custodian PR Sreejesh. Jasjeet, in particular, was not in his elements in India's backline as he committed a lot of errors. The Indians were completely outplayed by Argentina in the majority of the opening half by creating a number of scoring opportunities. Eight minutes into the second quarter, Argentina earned their second penalty corner, courtesy Ignacio Diego Paz's brilliant stick work in the right flank as he dribbled past four Indian players to earn the set piece. Even though the Indian defence managed to thwart that chance, they conceded two penalty corners in succession, the last of which was utilised by the Argentines when Menini found the back of the net in the 24th minute.